We’ve been a leading manufacturer of residential metal roofs since 1980. Proudly made in America using 95% recycled aluminum, our shingles, shakes, tile, and standing seam roofing products beautify and protect fine homes, churches, and other buildings throughout the United States, Canada, and around the world. We also have a new steel roofing product for projects that require steel. Our products are available throughout North America as well as in the Caribbean, Japan, and elsewhere. Independent dealers and contractors, along with our own Customer Support team, are available to meet your needs with a focus on increasing your home’s value and protection, and making your home the worry-free and comfortable investment it should be. Country Manor Shake is a lifetime roofing system of the highest quality and design. Our industry-leading PVDF coating is guaranteed to resist fading and chalking, and the four-way interlocking panels will withstand hurricane strength winds and hail. Rustic Shingle is an investment-grade metal roofing system that provides beauty, protection, and increased value. The 12” x 24” fully interlocking panels hold tight in even the most severe winds while the product’s low weight encourages installation over existing shingles. Oxford Shingle blends with any architectural style and in any neighborhood. While conducive to shedding winter snowloads, the low profile panels feature a heat-reflective coating that keeps homes cooler in summer and reduces air conditioning expense. 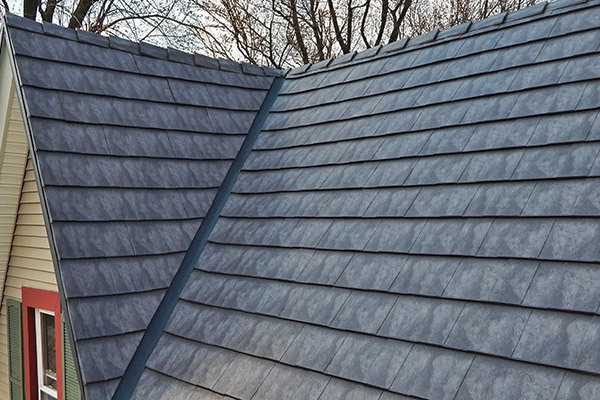 The Slate Rock Oxford Shingle is a unique product that combines the proven design and integrity of Oxford Shingle with the colors and texture of fine slate roofing. Our proprietary four-layer PVDF coating from Valspar is applied in a unique print process that enhances Oxford Shingle’s three-dimensional detail. Our team of full-time, metal roofing professionals has one focus: you. We’re here to answer your questions, and help you select the right roof for your home or other building. No question or detail is too small for this team: from the metal compounds and weights…to the color and style best suited to your project, we have answers. We can help you. Few roofs evoke such emotion as barrel tile roofs. 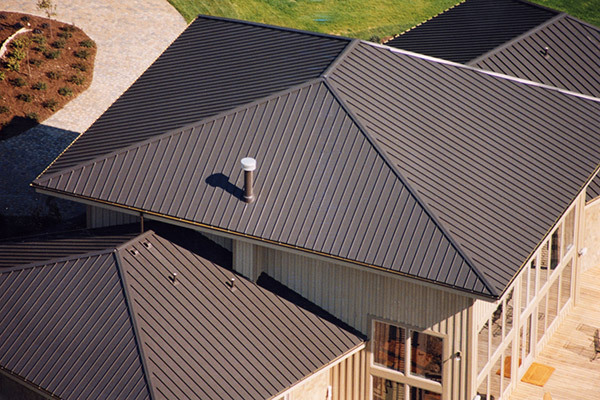 GrandeTile provides that distinctive look along with the proven benefits of metal roofing. Available in a variety of color choices, in either a smooth or pebble embossed finish to match your preferred style. For property owners who want a traditional metal roof, ClickLock is the answer. The 12” wide standing seam panels are sized for residential applications whereas many other standing seam systems feature larger panels more suitable for commercial buildings. Universal Standing Seam was specifically designed for customers who want the best possible combination of price and value for their homes. Produced from high quality US-made G90 galvanized steel that is .022” thick fora maintenance-free roof system. Researching a new metal roof? Start here. We’re here to help you whether you are just beginning to look at metal roofing, or have chosen a profile and are ready to choose a roofing contractor. 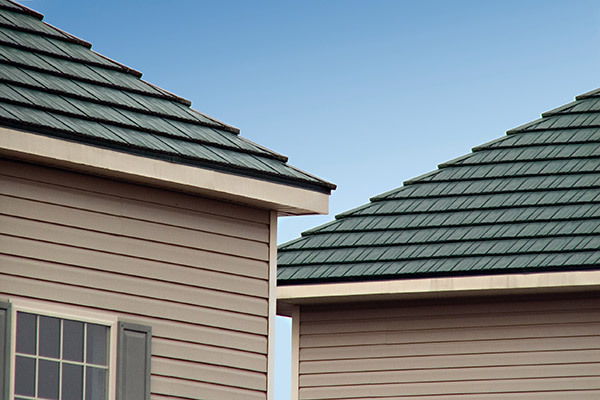 Use our About Metal Roofing section to help understand the benefits, energy savings, and the longevity of using metal on your roof. You’ll even find a handy list of metal roofing pros and cons. 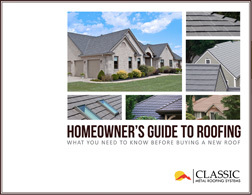 Use our free downloadable Roofing Guide for Homeowners to help gain the knowledge and tools you’ll need to pick the right product and hire the right person to install your home’s roof. If you have questions, you’ve come to the right place. Contact us to ask questions, or review our FAQ’s page for answers to many commonly asked questions regarding metal roofs.